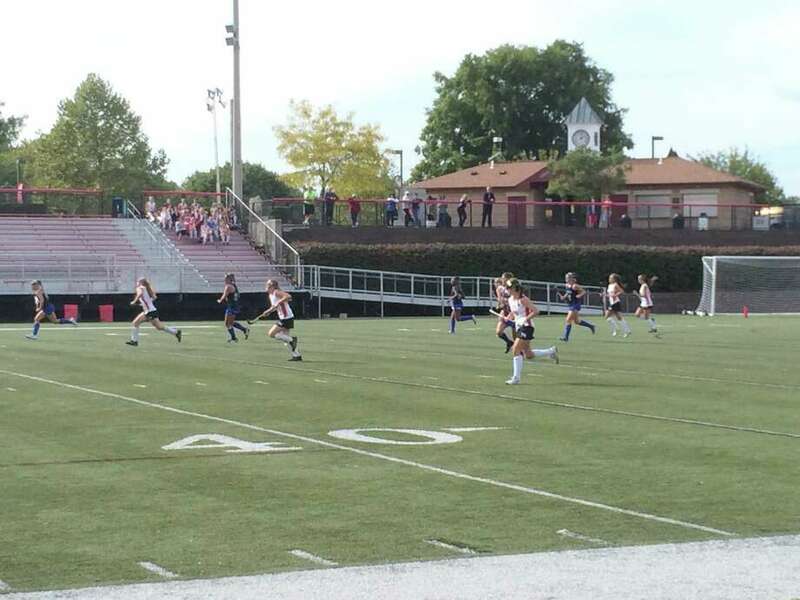 The New Canaan and Darien field hockey teams square off in a regular season game on Wednesday, Sept. 24, 2014 at Dunning Stadium. NEW CANAAN — After a successful summer in which the upstart New Canaan Athletic Foundation (NCAF) oversaw the resurfacing of Dunning Stadium, the group now has its sights set on next summer and further field improvement. Founder of the NCAF Mike Benevento and other members were at a Tuesday morning meeting of the Board of Selectmen to discuss their plans for the near future and their fundraising goals. “Many of us have youth players, or even some that will graduate into high school. This is really all about fairness and creating more athletic facilities and flexibility around what we can offer both our youth and, quite frankly, the JV and freshmen teams that don’t have the availability of the one premiere field that we do have available to us now,” Benevento said. In only a few months earlier in 2016, the NCAF, which was formed by Benevento after what he called stops and starts on the part of the Ram Spirit Fund in the past several years, was able to raise nearly $500,000 to finance the Dunning project, which Benevento referred to as Phase One. Phase Two, Benevento told the selectmen, would focus on ripping up and resurfacing the water tower turf field at New Canaan High School, turfing the grass strip next to the Water Tower turf field and rehabilitating the track. The redone fields would allow sports teams that don’t necessarily take precedent when scheduling, like field hockey, which Benevento said feels it doesn’t sufficient practice time on turf, and youth soccer, which is the largest youth sports organization in town, more playing time on turf. The plan to improve the track, Benevento said, would include an 8-lane track, storage sheds for equipment and a viewing stage at the finish line for spectators. Benevento said the NCAF is in the early stages of their fundraising campaign, but said they are looking to go above and beyond what they raised for Phase One. “We’re in what I would call more of a private part of the campaign right now, where we are looking to get additional anchor tenant donors. We will become a little more public... you build a pyramid, you get your big donors and then flesh it out into a little bit more of a wider base,” Benevento said. Because work can only be completed on the fields and track while school is out of session, and because the group will be working off of goals set by the town in its five year plan regarding athletic facilities that will be raised during the upcoming budget season, the NCAF is on strict deadline. “The expectation is that you’ll be able to raise large enough, in conjunction with town funding, to do these projects next summer,” Selectman Nick Williams said. First Selectman Mallozzi, though, seemed confident that the group would reach its goal. “I’m feeling good about where we are today, in October,” Mallozzi said.